Sometimes, a freekick can be too close. Strike the ball hard and there will not be enough space for the ball to curl down into goal. Or, it can be too far. In this case, the goalkeeper has all the time in the world to deal with it. But sometimes a freekick can be just the perfect distance from goal. The ball can be struck with enough force to make it rise above the wall and then curl down away from the goalkeeper’s reach. 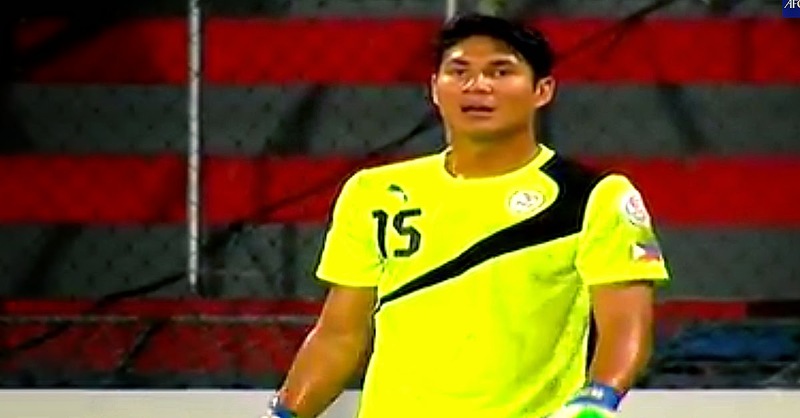 As it happened last night in the final of the 2014 AFC Challenge Cup between the Philippines and Palestine, the foul that Jason de Jong committed in the 57th minute was the perfect distance and position for Ashraf Alfawaghra to score the singular goal that won the championship for Palestine. Philippines goalkeeper Roland Müller, perhaps, was a half a step generous with the space he offered Alfawaghra to his right; and one rather wonders if Neil Etheridge, with his longer reach, could have saved the freekick. If we are all being honest, we were all probably intoxicated by the prospect of being with the big boys in Australia next year. However, the seat reserved for the Challenge Cup winner was always a short cut to the Asian Cup. That it was conceded in such a dangerous position was unnecessary since Robert Gier had moved up to close down Alfawaghra when the foul was committed, and the better option for de Jong was to run behind Gier to offer cover. Still, it will be improper to lay the blame on de Jong. The midfielder was, on the night, arguably at his least effectual in the entire tournament; but that the Philippines were in the finals at all was due in no small measure to de Jong’s determined graft. Besides, while there was no denying that de Jong’s challenge was a foul, there was a real question of why the Uzbek referee was overlooking similarly robust challenges by the physical Palestinians at the opposite end. That the Philippines were out-muscled will be a sound argument; but that the out-muscling was legitimate will be another matter altogether. Thomas Dooley, shown at one point in a heated discussion with the fourth official, doubtless will not be flattering of the referee in private. In all fairness, however, it will be difficult to argue that Palestine did not deserve to win the Challenge Cup. It was not so much that Müller was the busier of the two goalkeepers. Indeed, apart from the winning freekick and Haytham Theeb’s header in the 55th minute which rebounded from off a post, most of Palestine’s shots did not unduly trouble Müller. Rather, Palestine were the better side on the night because they settled quicker and were stingy at the back – hardly surprising for a team that did not concede a goal in the entire tournament. However, a football game always has the capacity to be as intriguing as a well-written novel with subplots and cruel twists. Despite taking the game by the scruff of the neck, the Palestinians could have gone down against the run of play in the 41st minute. Stephan Schröck played a delightful ball which squeezed past two defenders to Phil Younghusband, who had a clear sight of goal. A delicate chip would have beaten the advancing Palestine goalkeeper Ramzi Saleh; but Younghusband opted for power and blasted over. In retrospect, the Philippines arguably peaked in that physically and emotionally draining semi-final against the Maldives. The sheer effort poured into that match along with the expectable nerves of being in a first-ever continental final was probably why the up-tempo pressing could not be replicated in the final. There is great wisdom to the proverb ‘one step backwards, two step forward.’ Sometimes, you also do not have to get receive a trophy to win. There will be disappointment in that the Philippines will not travel to Australia for the Asian Cup. However, in perspective, the runners-up finish is not only a tremendous achievement but, more importantly, an investment for the future. It will only be years from now when we all fully realise the full value of 19-year old Amani Aguinaldo’s participation in this major final, not only in terms of the value of the experience to his development as a player but more in the number of home-based youngsters inspired by the knowledge that there is a way through to the national team. In a few short months, Dooley has given the squad real depth with his willingness to let youngsters off the leash. Apart from Aguinaldo, Daisuke Sato and Kenshiro Daniels were the other teenagers involved in last night’s final. The squad now has a fine balance of youth and experience. While the Philippines might have lost the final, there was also a fair amount of ordnance missing by way of injury and club commitments: Etheridge, Juani Guirado, Dennis Cagara, Jeffrey Christiaens, Carlos de Murga can all probably make the starting line-up of any team in the Challenge Cup. There was also the little matter of Schröck being hampered by a hamstring strain. Sometimes, one can enjoy the better view when one takes the longer route. The Challenge Cup is now history! Bring on World Cup and Asian Cup qualifying! Acknowledgment: Photos captured from videos on The AFC Hub on YouTube.